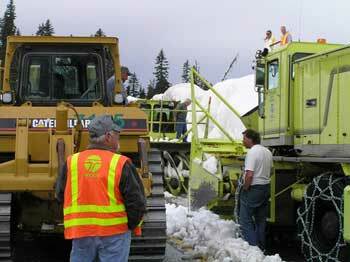 Roadway crews from the west and east sides came together on Friday May 19th. This week crews have been busy widening out, addressing tip outs, removing rocks, ditching, installing signs, brooming, removing equipment, etc. 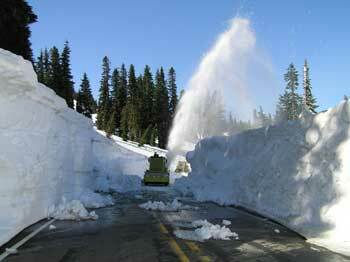 All of these finishing touches are leading up to the Opening of Chinook Pass on Thursday May 25th at Noon. 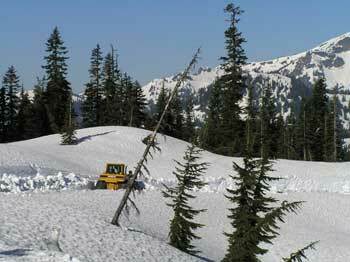 The Avalanche crew is winding up their work and helping roadway crews address some of the tip out areas. Construction work on the washed out section of roadway 2 miles east of the Summit is now complete. Construction crews paved and striped last week and finished guardrail work this week. The weather this week has turned nasty. Cloudy, rainy, and foggy. High temperatures in the upper 30's this week. Snow is predicted this weekend down to 4,000 feet. Travelers this weekend can expect cold and possibly snowy conditions. 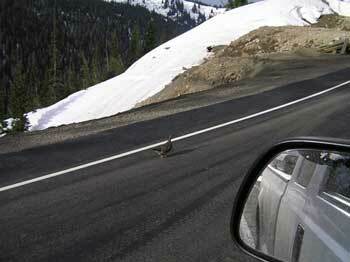 Travelers are advised to use caution and watch for rocks and tip outs. 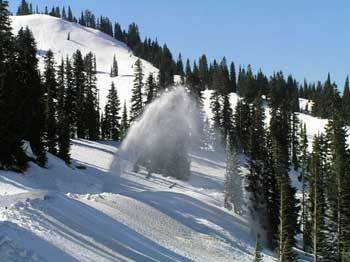 Travelers are also advised that further snowfall could necessitate some delays for avalanche control work. Maintenance crews will be making routine road patrols this weekend for rocks and tip outs*. 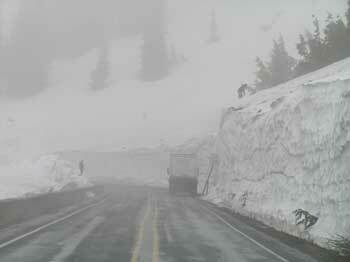 Avalanche crew members will also be present to monitor for changing conditions. *An explanation of Tip outs: Some of the snow drifts that we cut through are very, very deep, leaving a vertical wall near the roadway surface. As conditions change, these walls of snow will start to "tip out" toward the roadway surface, with the potential to actually fall on a vehicle. When we identify that there is potential for a large tip out, that could create a significant problem, we need to do some avalanche control work, forcing the snow to come down in a controlled environment, and hopefully eliminating the danger. This type of work was actually done on Chinook during the Memorial Day weekend (successfully). We should be out of the woods now, and no more control work should be needed, but it can change quickly.